For our book club meeting last night, I made these incredibly rich chocolate meringue cookies. 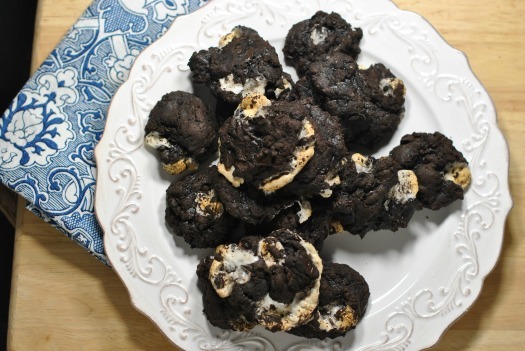 By adding marshmallows, the cookies became Rocky Road Chocolate Meringue Cookies, a nod to the rough life of the main character in The Goldfinch. 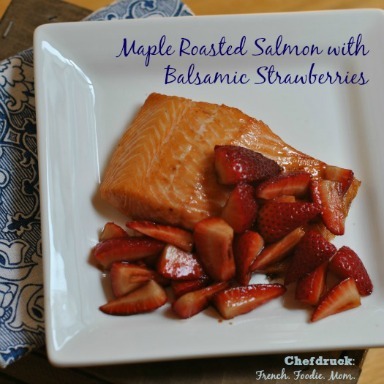 I modified a recipe I found on Eva’s Daily Doses of Sugar blog. Eva’s recipe was adapted from One Cake Two Cake‘s recipe. So fun to discover all these chocoholics and tracing the steps of a recipe through time and pages of Google images. Our book club likes to serve food somehow tied to the book we just read. In a book filled with stolen art works, gregarious Russians, and New York socialites, there was very little chocolate. The ladies didn’t seem to mind. These chocolate meringue rocky road cookies disappeared more quickly than the Goldfinch after the Metropolitan bomb explosion. 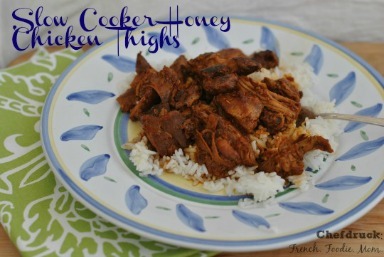 When they were all gone, everyone made me promise to share the recipe on the blog. Like a Russian mobster, I keep my promises. (Are you tired of the references to the Goldfinch yet? Read my full short review as to why it’s well worth your loss of sleep to put this awesome novel on your nightstand). These are not as crispy and light as typical meringues. You begin with an egg white and powdered sugar meringue, that’s whipped into a thick and shiny base. When you lift the beaters, the egg will fall in thick ribbons, rather than soft or hard peaks. Then fold in more powdered sugar and a generous combination of cocoa powder and melted chocolate. Finish with chocolate chips and marshmallows. Having high quality chocolate and cocoa powder is key. You will really taste the difference. Once all the chocolates are added, the dough will be almost gritty and somewhat dry to the touch. It might look alarming, but no worries. After just 10 minutes in the oven, these cookies are ready. Let them cool for at least 10 minutes or they will fall apart in a messy gloop. Let them cool and all will be well. Trust me. You know you can. 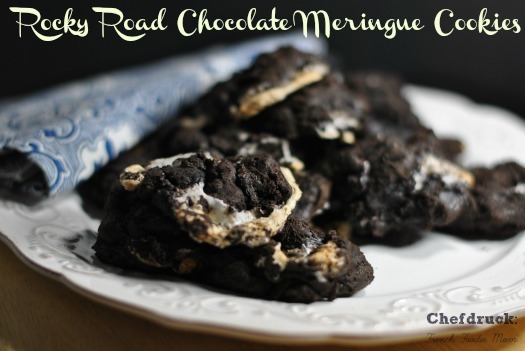 These rocky road chocolate meringue cookies are incredibly rich and decadent. 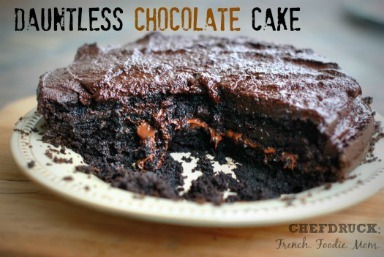 They come together with just a few ingredients and will make any chocoholic very, very happy. Line two large baking sheets with parchment paper or a silpat. Sift together ¾ cups of powdered sugar, ½ cup of cocoa powder, flour and salt. Set aside. Heat 1 cup of chocolate chips in glass bowl in microwave for 1 minute. Stir. Microwave for another minute until melted. Let it cool for a few minutes. Using electric mixer, beat whites in large bowl until soft peaks form. Gradually add in ¾ cup sugar, continuing to beat until the mixture is white and very shiny. 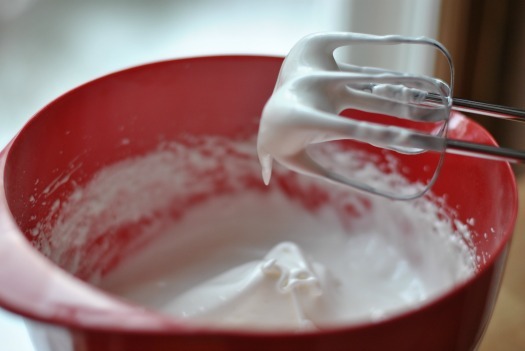 The beaters should drizzle ribbons of egg white when you pull them out. Using a wooden spoon or spatula, mix in the cocoa and sugar mixture. The eggs will begin to get gritty at this point. Don't worry! Stir in lukewarm chocolate and the marshmallows and last ½ cup of chocolate chips. Either using an cookie dough scooper or a soup spoon, scoop out rough 1 inch balls of dough. Roll them into a more regular ball with your hand. Place at least 1 inch apart on the cookie sheet. Cool on sheets for at least 10 minutes.